Low smoke halogen free flame retardant polypropylene (PP) market size will increase from over 185 kilo tons in 2015, with more than 8.5% CAGR growth predicted from 2016 to 2023. Regulations pertaining to fire safety accompanied by environment consciousness are assumed to play a critical role in positively influencing the global low smoke halogen free flame retardant polypropylene market growth. North America, dominated by U.S. low smoke halogen free flame retardant PP market size is calculated to surpass USD 285 million by 2023, growing at estimated CAGR of 8.5% up to 2023. North America regulatory agencies such as Bromine Science and Environmental Forum (BSEF) members and Environmental Protection Agency (EPA) have also prohibited halogen containing flame retardants due to their negative effects on the environment and living beings. Moreover, EPA has also started collaboration with industry leaders to identify halogenated flame retardants substitute used in the electrical & electronics industry, which may influence product demand in North America. Favorable policies and regulations have been initiated by various fire safety authorities to avoid from harmful product effects. In EU, directives such as REACH, WEEE and RoHS has implemented the ban against toxic & flammable substances usage which is expected key driver to instigate low smoke halogen free flame retardant polypropylene market growth. Republic of Korea and China have also put into practice WEEE and RoHS, to control harmful product usage which should boost industry growth. Heavy construction spending owing to rise in urbanization and industrialization may result growth for low smoke zero halogen flame retardant PP industry. Mexican government has elevated its annual infrastructure construction spending and initiated a National Infrastructure Plan to raise around USD 550 billion investments in coming years. China have also witnessed rapid growth in building and construction industry spending owing to increase in manufacturing capacity and rise in disposable income. In 2015, China construction industry was worth over USD 1.63 trillion and is anticipated to double up its spending over the forecast period. These retardants have some drawbacks such as high loading level, colour impartment, and higher level of feeding & dosing. These products are safer and have various positive characteristics, but few operational challenges inefficiency in red or dark colour application may restrict market growth. Electronics & electrical is among the major industry pushed to avoid halogen containing hazardous products in the recent years which is instigated to witness more growth prospects over the forecast period. Automotive industry is predicted to create more opportunity due to the increase in polymers preference over metals. Fire safety & toxicities may drive low smoke halogen free flame retardants polypropylene trend in furniture application. Construction applications dominated the industry demand and may surpass USD 310 million by 2023, North America construction application revenue was close to USD 54 million in 2015. Industrial & domestic infrastructure demand owing to increase in disposable income & fast urbanization growth accompanied by government’s strict fire & safety regulations are among the key factors to drive demand in this segment. Automotive application was valued at over USD 85 million in 2015. Metal replacements by polypropylene to reduce vehicle’s weight which eventually produce high fuel efficient cars were the key demand generating factor. Automobiles sales growth coupled with stringent vehicular emissions regulations may drive low smoke halogen free flame retardants polypropylene market. 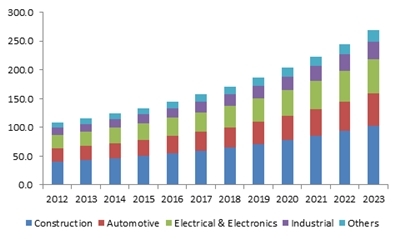 Electric & electronics application is set to witness highest growth, with expected gains at over 9% CAGR up to 2023. Electrical & electronic appliances and cables proximity to human beings makes the use of these products demand extremely critical in order to prevent from toxicity and fire. North America dominated the regional industry demand and is projected to exceed USD 285 million by 2023. The U.S. was the major contributor owing to EPA norms which phased out bromine based products that are highly toxic which has resulted in increased demand for these products. APAC, influenced by China and India low smoke halogen free flame retardant polypropylene market share is projected to grow significantly at over 8.5% CAGR up to 2023. Global low smoke halogen free flame retardant polypropylene (PP) market share is partly consolidated and mainly dominated by four major companies including Albermale, ICL, Clariant and Nabaltec. There is a certain level of integration within the value chain observed among raw material suppliers, flame retardant producers as and polypropylene manufacturers. The possibility of forward integration by the raw material producers to become product manufacturers is high due to standardization of technology and easy raw material availability. Other prominent market participants include FRX Polymers, Chemtura, Delamin, DuPont, BASF, and RTP.